Montana Bounty Foods Gift eCard $25 Value for only $20! Give the Gift of Real Montana Cooking! For a limited time, receive a $25 dollar value for only $20 at Montana Bounty Foods! Personalize your Gift eCard with the recipients name and message. Enjoy giving the gift of delicious Montana cooking! Gift eCards will be sent to your email address within 24 hours of your purchase and available to use right away! The full value of the Gift eCard must be used in a single purchase cycle and cannot be spread out over multiple purchases. Free shipping does not apply during the redemption of the Gift eCard. 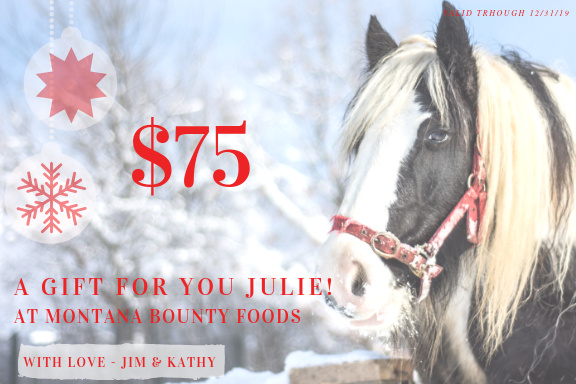 Montana Bounty Foods Gift eCard $75 Value for only $50! For a limited time, receive a $75 dollar value for only $50 at Montana Bounty Foods! Personalize your Gift eCard with the recipients name and message. Enjoy giving the gift of delicious Montana cooking!